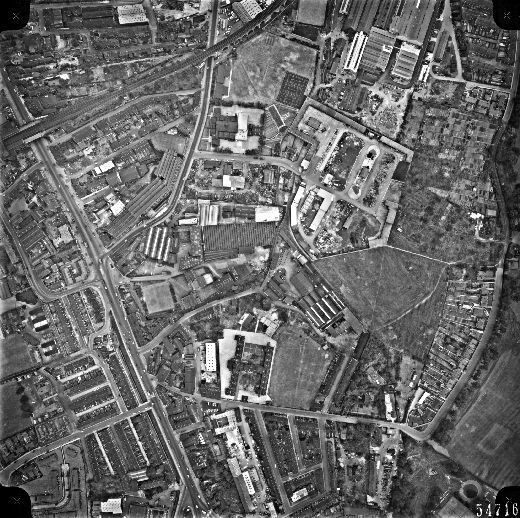 Black and white aerial view of M.P. Stonehouse's mills off Ings Road was taken for Wakefield City Council in 1961. M. P. Stonehouse was oringally a worsted spinner founded in 1853 by Mathew Porritt Stonehouse and was based at Albion Mills in Wakefield. The factory’s main focus was carding and spinning uncombed worsted yarn for carpets and for hand-knitting. In 1855 M P Stonehouse is recorded as having employed 16 people, 100 workers in 1869 and by 1874 was paying wages to approximately 200 workers.